This security poster illustrates the TM-100/200/500 Demolition Charges. These demolition charges can be used both as anti-personnel mines and as booby traps with military fuzes. Although they are designed as three sizes of demolition charges, they were also used as improvised mines. Each charge has a threaded fuze well which allows a variety of fuzes to be screwed into place. 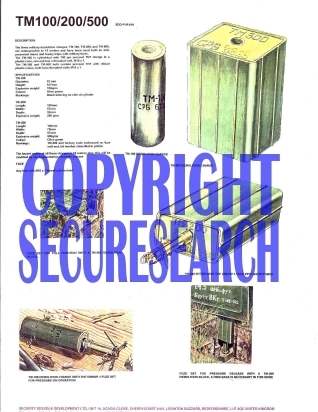 This security poster features the technical specifications of all three of the demolition charges, a TM-100 demolition charge, a TM-500 demolition charge, a TM-200 demolition charge with the UMNOP-1 fuze with safety wire, a fuze set for pressure release with a TM-200 demolition block, a TM-100 demolition charge with the UMNOP-1 fuze set for pressure-on operation, and a fuze set for pull function with a TM-500 demolition block. A TM-200 demolition charge with the UMNOP-1 fuze with safety wire. A fuze set for pull function with a TM-500 demolition block. A TM-100 demolition charge with the UMNOP-1 fuze set for pressure-on operation. A fuze set for pressure release with a TM-200 demolition block. The technical specifications of all three of the demolition charges. This security poster features the technical specifications of all three of the demolition charges, illustrations of all the demolition charges, and all three demolition charges with fuzes set for pressure release, pressure-on operation, and pull function.